Home › Publications › Papers › Political Islam: Does the U.S. Want to Engage Effectively? Political Islam: Does the U.S. Want to Engage Effectively? Three issues are vital to U.S. security in the Middle East and will define America’s future relations with the Muslim world: the peace process (in Palestine, as well as in Iraq and Afghanistan); the United States’ continued support for corrupt and repressive allies; and political and economic reform. In all three issues, Islamists, whether it Hamas, Hizbollah, Taliban, Iran, or more mainstream movements such as the Muslim Brothers in Egypt, the AK Party in Turkey, or the Justice and Development Party in Morocco, are key players. The United States must engage them in order to create a realistic and workable long-term strategy and relationship with the Muslim world. Perhaps to the surprise of most Americans, who are always ready to believe that the United States fights only for good causes, the majority of Muslims view the United States as a hostile and oppressive force that has committed excessive and unnecessary killings of Muslims; suppressed public will; and blindly supported Israel at the expense of the legitimate rights of the Palestinians. Many believe that the current U.S. war against global terrorism is a war against Islam. This is precisely the image President Obama would like to change. Fortunately, his administration has an historic opportunity to do so. So far, Obama is popular among Muslim peoples who are ready to start a new chapter in U.S.-Muslim relations. However, they would like to see his policies catch up with his rhetoric. Moderate Islamic movements would like to have positive relations with the U.S. and the West in general — ones that are based on fairness, mutual respect, and mutual interests. Since his inauguration, President Obama has called for a “new beginning” with the Muslim world and for engaging Muslims in a relationship based on mutual respect and interest. The administration has adopted a new lexicon and a more nuanced approach in dealing with Muslims. This is more clearly evident at the level of rhetoric than in actual policy change. To turn its words into reality, the administration should open up to the Islamists. Their evolved platforms and agenda are really not that different from the interests of U.S. and Western governments: fair and just resolution of the Palestinian issue; promotion of political reform and democratization in Muslim societies; social justice and economic growth; rule of law; government accountability; pluralism and human rights; and efficient judiciary. Moderate Islamic movements would like to have positive relations with the United States and the West in general—ones that are based on fairness, mutual respect, and mutual interests. This is similar to the new beginning that President Obama has advocated as basis of a new chapter in U.S.-Muslim relations. Moderate Islamist movements are effective at the grassroots levels and enjoy more popularity and legitimacy than the incumbent regimes that U.S. administrations have supported for decades. Engaging these movements in promoting mutual goals will give them a sense of ownership in the process; make them appreciate U.S. and Western concerns and interests; and empower them in regard to radical and violent movements. Of course, there is some risk involved in this engagement. Pro-western authoritarian regimes will feel threatened by the increased stature and recognition of Islamists, but that could be a strong motive to reform and be accountable. Another risk is the security of Israel. This is precisely the area of contention between Islamists (Muslims in general) and the United States. This is all the more reason for the United States to engage with Islamists who are directly involved in these conflicts. Hamas, Hizbollah, Syria, and Iran are no more radical than Taliban, yet there is now a growing acceptance in the administration of talking to Taliban and perhaps including them in a future reconciliation in Afghanistan. The peace process, political reform, and economic development should all go hand-in-hand with engagement with moderate Islamic movements. The key question here is not how to do so, but whether there is the will to engage effectively. As a start, the Obama administration should develop a strategic peace plan with the Muslim world. 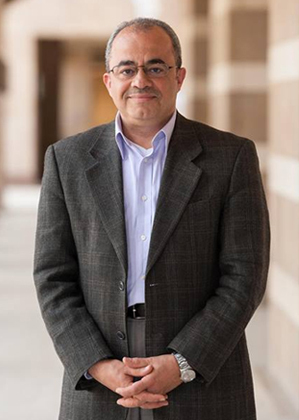 Emad Shahin is the Henry R. Luce associate professor of religion, conflict and peacebuilding at the Kroc Institute.